Sometimes, the best thing that you can do for your employees is to replace the handset cords on their desk phones. When you are looking at the phone needs that you have within the office, one of the things that you are going to discover most often is employees who are complaining about handset cords. Some will tell you that the handset cords on their phones is too short. Others will tell you that the handset cords on their phone are either coming loose at the connection and causing static on the line. Still others will tell you that they just can't deal with the handset cords on their phone and the fact that they always seem to be tangled up. The good news is that if you have staff members who are complaining about the handset cords on their phones, the problem is fairly simple and inexpensive to remedy. 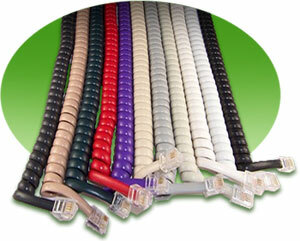 You will find that it is possible to replace the handset cords on your company phones with a 4-conductor coiled cord. If the complaint is that the handset cords are too short, you will be able to replace them with cords that are six feet or even twelve feet in length - ensuring that your employees will be able to move around if necessary. Most importantly, in many cases, it is possible to replace the original handset cords with a cord detangler that will prevent twisted, knotted cords - which will not only be more convenient for your employees but that will also keep the cords lasting longer. Whether you are looking for replacement handset cords in basic black or other colors, you're sure to find what you're looking for.